August 2009 - Post camp years found me attending University of Richmond. I entered the Army Special Forces (Green Berets) in 1969 and attained the rank of Sergeant E-6 before getting my honorable discharge. I played bluegrass banjo in various bluegrass bands and opened my own mom-and-pop music store, Baltimore Bluegrass, Inc. in 1975. We prospered for 25 years until the big-box stores forced us to close. They were very good years. During the music-store years I learned the luthier trade and became the only Martin Guitar repair person in Baltimore and surrounding area. At the time the store closed I was already making good money on the Internet by directing surfers to affiliate sites for commission. That all ended when the search engines started the bidding process for search terms. Concurrent with running the music store and repairing instruments, my avocations included playing guitar, banjo and fiddle, webmastering, computers, and research on the positional morphology of the fossil teeth of Palaeocene - Eocene sand sharks. My fossil shark-tooth research is ongoing and I have studied positional morphology at the Smithsonian Museum of Natural History and the British Museum of Natural History. So far, I've published a research paper in Tertiary Research Published in London and an article about Modern Carcharius taurus teeth for elasmo.com. I retired at the age of 52 (in July, 2000 - when my store closed) and am now a commercial landlord and webmaster for several websites. I continue to do fossil shark research and webmastering. I turned 61 in July, 2009. I married Amanda at the age of thirty-six and have a daughter, Laura, who graduated from New York University with honors for Music Production and Environmental Studies. Closing: Baltimore Bluegrass - a haven for guitar pickers for nearly 25 years - is going out of business. After nearly a quarter-century, they're about to sell the last pick and play the final lick at Baltimore Bluegrass. The Northeast Baltimore acoustic music store - which has provided instruments, accessories, sage advice and weekly jam sessions for a generation of amateur and professional musicians - is going out of business. Owner Steve Cunningham, a banjo player who opened Baltimore Bluegrass "on a whim" in November 1975, said this week that he is closing the Belair Road store - which offers everything from top-of-the-line Martin guitars to hard-to-find publications - because of increasing competition from the Internet and large retailers. "I don't feel sorry for us; I feel sorry for the people who depended on us," said Cunningham, 51, who has yet to set a closing date but has published his final newsletter and begun a close-out sale. Among those who depended on the store is the guitar-playing leader of the local Irish band O'Malley's March. "Oh, no!" Baltimore Mayor Martin O'Malley exclaimed when informed of Baltimore Bluegrass' plans to close. "That's my place." O'Malley said he bought his guitar strings and picks at the store, and called Cunningham "my guitar doctor." 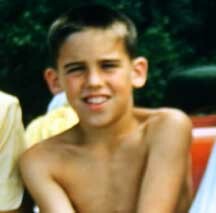 "The only guitar lessons I ever had - all four of them - I took there," the mayor said. Musicians aren't the only ones dismayed by the impending demise of Baltimore Bluegrass, housed in a two-story building that Cunningham has a tentative agreement to sell to a waterproofing company. The closing comes on the heels of an announcement that Bo Brooks Crab House, a fixture on Belair Road for nearly four decades, is moving to Canton. Bo Brooks, as much an institution to crab pickers as Baltimore Bluegrass is to guitar pickers, is scheduled to shutter its northeast location by the end of this month. Besides their popularity, Baltimore Bluegrass and Bo Brooks are long-standing symbols of the eclectic mix of businesses along the northern stretch of Belair Road in the city. The strip is studded with car dealers, repair shops, restaurants and carryouts, and small businesses, and a smattering of store-front churches. Though Cunningham said his decision is not a reflection on the neighborhood - in fact, he said, he feels safer on Belair Road than he did a decade ago - some are concerned about the back-to-back closings of two businesses with such wide followings. "Any time you lose a business on a main strip like Belair Road, it's a concern," said City Councilman Nicholas C. D'Adamo Jr., whose district includes the corridor. "I don't think the city's in any position to lose a business." Harold Y. Borden Jr., an insurance agent and head of the Gardenville/Belair Business Association, said he is "saddened" that Baltimore Bluegrass is closing but heartened about the plans to sell the building. "We don't want vacant buildings," said Borden, who added that he expects a Walgreen's drugstore to take over Bo Brooks' spot. But he called the competitive pressures that Cunningham described "a sign of the times." "You've got malls only five or 10 minutes from here," he said. "The only thing you can do is hope. Belair Road is still a busy place." Executives at the most prominent business along Belair Road, the Al Packer auto dealership, remain upbeat about the corridor. Al Packer is building a new dealership in White Marsh, but it will be in addition to its new and used car dealerships on Belair Road, general manager Richard Sherry said. This road has been very good to us, and it's getting better all the time," he said. The Appalachian Bluegrass Shoppe in Catonsville has also felt the sting of on-line and big-store competition, said manager Howard Markman. Although he's confident about the future of Appalachian Bluegrass, which has been specializing in acoustic music since 1983, Markman is elegiac in talking about Baltimore Bluegrass. "It's been an important part of Baltimore's musical heritage," said Markman, who said the stores were "competitors in a good way." "In that way, it'll be sorely missed," he said. Those who frequented Baltimore Bluegrass - a store distinguished by its weathered wooden floors, guitars hanging from the ceiling and mandolins strapped to its photo-festooned walls - sound the same sad notes. 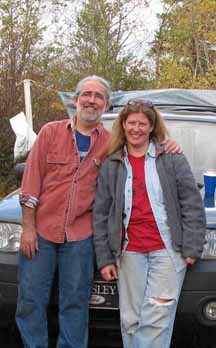 "It's another part of the old rock disappearing," said Dan Poehland, a retired letter carrier and guitar player who has a country duet with his wife, Cil, called the Singing Sweethearts. Poehland, who stopped by the store this week to chat, said the thing he'll miss most is the personalized repair service. "Steve just put five new frets on my guitar a couple of weeks ago," said Poehland, who bought his Martin guitar at Baltimore Bluegrass in 1986 and all of his strings and picks there since. 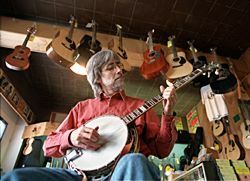 Bob Kambic, a researcher at the Johns Hopkins' School of Public Health, has been a regular for years at the Friday night jam sessions at Baltimore Bluegrass, where pickers and listeners would at times spill out the front door. Kambic, a guitar player, said the sessions offered very good music - and even better camaraderie. "It's a very nice social event, a way to be with people," he said. "Everybody learns to take a lick or a lead-in. Nobody wants to know who you are or what you do." "Musicians in Baltimore have to be grateful they've been here as long as they have," he said of the store. That's typical of the atmosphere Cunningham has promoted since he opened the store. "We're not anxious to sell you a guitar," he said. "We're anxious to become your friend." But recently, he said, he has noticed a lessening of the customer loyalty that he found in the past. "The idea of supporting a store is dissolving," he said. And so Cunningham, who's married and has an 11-year-old daughter, decided to "go out now when we're ahead, instead of waiting for the inevitable." The absence of a definite closing date is in keeping with the casual way Cunningham has run his business for 25 years. "I didn't know how to open a store," he said. "I don't know how to close one." Now, he looks forward to spending more time with his avocation of studying fossil shark teeth, and has no regrets the store will not be around for a formal 25th anniversary celebration in November. "I see this store as one big party for the last 25 years," he said.